The experience so far has been both fascinating and frustrating. Conceptually it sounds wonderful: provide a free and open scriptable 3-D environment with public and private spaces, unencumbered by the requirements of structured narrative or points-and-levels systems, thus freeing users to make what they will of their virtual space. Visual and conceptual art, role-playing, chat, conference, music, dancing, costumes, battle, terrorism, and various forms of simulated sexual activity (in which I have of course refrained from engaging) are all possible, given people, tools, scripts, virtual land, and Linden dollars (the local currency). The result is a mixed landscape of strange 3D art, garish commerce, and gatherings of avatars in various shapes and costumes. 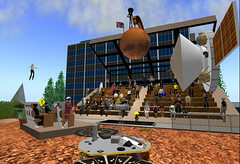 Much of the world is like a vast, deserted museum of Dadaist architecture — deserted, but for conglomerations of green dots on the map, usually welcome locations where casual users appear immediately upon login, and, not bothering to move from the teleport hub, simply use the world as a glorified 3D chat room, whose art and commerce serve mainly to provide extra avatar bling. You can tell I’m not too fond of hanging around those chatty hubs. Rather, on some days, I like to walk over to the nearest roadside sandbox, rez a car or bus or plane or spaceship, and drive/fly around the mainland to gawk at things. I say “on some days” because the world often suffers from lag: slow loading of land, objects, and textures due to heavy user activity. Second Life doesn’t handle high bandwidth traffic too well (and neither does my DSL connection), and it’s almost a regular occurrence that I find myself travelling faster than the world can load around me, such that I must pause in my movement to wait for land and trees and buildings and people to pop into existence, first as featureless gray polygons, then shapes with blurry details, and eventually actual objects and avatars with textures and colors on them (or black-on-white “Missing Image” placeholder textures) — and that’s with draw distance and detail set to their lowest. Add to this the constant banging into red-outlined parcels due to entry restrictions, or “expired region handoffs” caused by botched transitions between servers handling adjacent land areas, and the experience of the virtual world can get annoying very fast — or slow, depending on how you look at it. 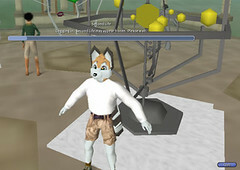 Despite these drawbacks, Second Life has proven its usefulness and entertainment value on more than one geeky occasion. I spent Yuri’s Night hanging around the party at Extropia, chatting about spaceflight tech and history and examining their Soyuz and lunar rover replicas. 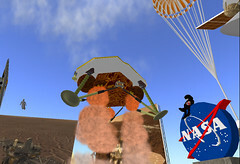 While the Phoenix Lander was descending to Mars, I visited JPL’s Explorer Island to watch the landing event, joining a crowd of other avatars to watch an animated 3D model of Phoenix play out the landing process while JPL representative avatar “Jet Burns” answered questions from the audience. In both cases there was a sense of immediacy, immersiveness, and community exceeding the experience of text and images on a web forum or chat room. So one could say I’ve been getting into this pretty heavily, though I haven’t yet gone so far as to exchange actual money for Linden Dollars (you can “camp” for free money at various freebie sims who pay you a pittance to boost their traffic numbers), nor have I paid to rent property from a landowner. I have been hanging around sandboxes working on dwellings, vehicles, weapons, and other fun stuff. 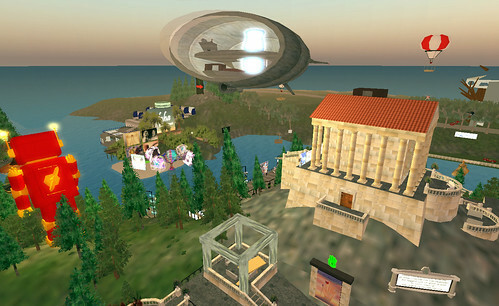 Coming of Age in Second Life: An Anthropologist Explores the Virtually Human — UC Irvine Professor Tom Boellstorff’s fascinating in-depth survey of virtual worlds from an anthropological viewpoint. 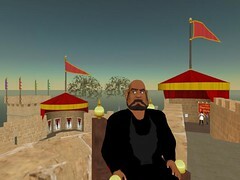 Warren Ellis on Second Life, part of Reuters’ SL presence. I especially like “Shipwrecked and Abandoned,” on the virtual blight of an underpopulated online world. And of course, Something Awful’s now-defunct Second Life Safari, which provided much unwholesome lulz during its too-brief run. Update: Oh yeah, I forgot to post Dancing Vader. That was me as a newbie avatar on a free money camping pad in Freebie Heaven. The result is a mixed landscape of strange 3D art, garish commerce, and gatherings of avatars in various shapes and costumes. Oh yeah, and Darth Vader dancing. I’d forgotten all about that video from my newbie days. I just watched the CSI: NY episode featuring Second Life. Twas a pretty good marketing ploy — I wanted to play.